The Mediterranean Sea laps the coast of the French Riviera in France, Europe. Considered one of the most expensive and luxurious regions in the world, the French Riviera is the home to many rich and famous people. The French Riviera is also known (in French) as the Cote d'Azur and stretches from the Italian Riviera west beyond Cannes. The extent of the French Riviera is disputed, some saying it stretches as far as St Tropez and beyond. There is no doubt that the most lucrative and prestigious areas of the French Riviera are Monaco, Monte Carlo, Nice, and Cannes. 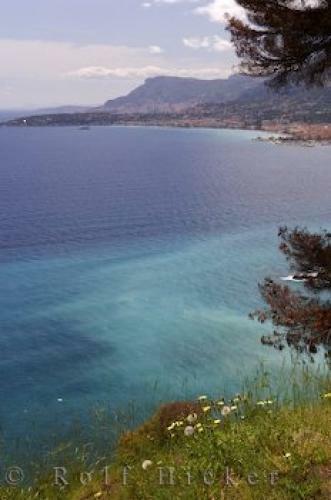 The sparkling waters of the Mediterranean coastline are a playground for sun lovers from around the world. Mediterranean Sea, Coastline, Corniches de la Riviera, French Riviera, Cote d'Azur, France, Europe. or Cote d'Azur in France, Europe.